Source: 2016 GSMA Mobile World Congress Surpasses Record 100,000 Visitors. Top row: Nokia’s MWC booth panoramic: left wing, central area, right wing. Bottom pic: central area. Lean Ops turned out to be a popular NFV (Network Functions Virtualization) demonstration, though by invitation only. Our team ran 160 sessions: the new Lean Ops’ live demonstration system can be declared battle tested. Left: Bhaskar Gorti. Right: Ted East, Carlos Manzanares, Jose de Francisco. On MWC16’s first day, Bhaskar Gorti, President of Nokia’s Applications & Analytics Business, ran the Lean Ops demo during NFV Implementation: Beyond Cost Savings. That executive panel discussion was moderated by Heavy Reading’s Gabriel Brown. The network operators were represented by John Donovan, AT&T’s CSO & Group President leading Technology and Operations. That session took place at Hall 4 Auditorium 2, a 600 seat room. Full house and plenty of people in the audience were taking pictures and recording videos throughout Bhaskar’s demonstration, whose tablet connected to our tech room back in the booth. Afterwards, Facebook’s Mark Zuckerberg delivered his keynote next door, in Auditorium 1. Early on Ted, Carlos and I had planned to take turns at the booth’s demo station. However, the three of us ended up there together talking to different groups at the very same time on numerous occasions. As outlined in this short introductory video, we discussed (a) the value of end-to-end solutions coupled with (b) service level orchestration. Bhaskar’s impressive stage demonstration generated interest and visits to our booth to see more. Experiencing Lean Ops at MWC16. From left to right: Auditorium, demo station at Nokia’s booth, VR (Virtual Reality) and video recording. Lean Ops’ state of the art is based on products and technologies that exist today. That involves a broad cross section of our product and services portfolio, and partners from the ecosystem program. We also address what’s next by discussing near future capabilities and the path forward. Moreover, we share forward looking concepts illustrating the art of the possible and, therefore, how to future proof investments in cloud computing. Our conversation was centered on virtualized networks and cloud technologies specifically designed for the telecommunications industry. We shared Nokia’s know-how on running highly efficient systems and effortless operations, “lean ops” in short. Being this “Mobile” World Congress, we purposely focused on environments as sophisticated as today’s 4G networks and ran live multimedia calls while conducting a wide range of operations and full lifecycle use cases. We addressed the role of analytics, programmability, automation and human factors engineering in that context, which become only more preeminent when IoT (Internet of Things) and 5G come to fruition. I would like to stress the fact that it pays to embrace elegant sophistication by first acknowledging the fact that global telecommunication networks happen to be complex. We don’t shy away from reality checks and that is why “Lean” becomes a guiding principle to start small and nimble and, equally important, to remain agile when scaling. If interested, here is a link to our Lean Ops Manifesto. This document is a year old already. Please stay tuned as I am working on the next version. In the meantime, here is “Communications Networks Reloaded,” a companion presentation whose three versions have registered 2,144 online views at the time of writing this. Those of you already familiar with proven Lean practices in other industries will notice that I adopted, evolved and re-defined what “lean” means to best address the needs of Network Functions Virtualization (NFV.) Long story short, Lean Ops is defined and lives at the intersection between “effective” service delivery and highly “efficient” operations at any scale. Left: Barcelona’s MWC crew. Right: Cloud Innovation Center – Chicago team. This year’s Lean Ops program benefits from a wealth of insights captured in discussions with 1,500+ experts (network operators, analysts and public officials) during our 2015 roadshow. I would also like to highlight our team’s tireless dedication, work ethic and ingenuity as well as invaluable support provided by a number of people across our business worldwide. Left: Nokia Networks tweet. Right: Nokia Global Careers tweet. One more thing: MWC might have prompted our very first major industry appearance as “one team” since Nokia’s acquisition of Alcatel-Lucent in January of this year. It is worth sharing that many customers were impressed by the speed of the integration. Nokia’s successful MWC16 doubles as a catalyst: everyone’s professionalism and workmanship took teamwork to new levels in Barcelona. I’m glad I had the chance to be part of that effort by experiencing what we can accomplish together first hand. Lean Ops’ MWC photo album. See you at NFV World Congress in April. “A strategic relationship with Alcatel-Lucent, intended to bring new levels of innovation to network operations. The agreement establishes a joint reseller and OEM agreement between the two companies (…) the transformation to a software-defined data center is going to keep picking up steam. 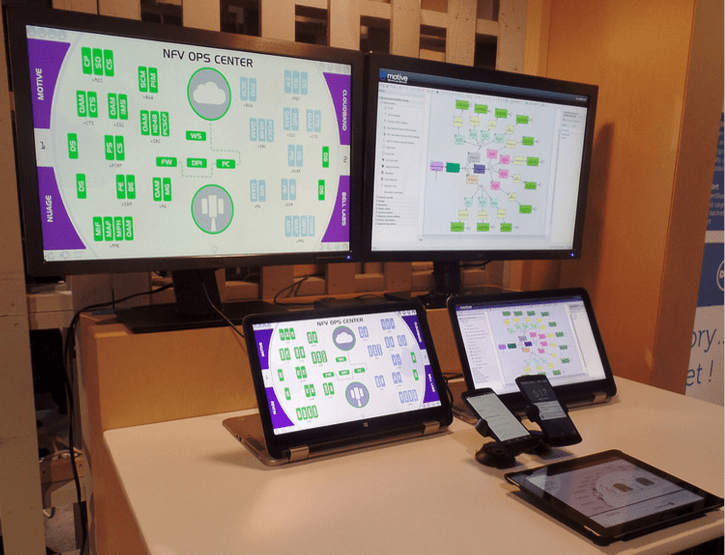 Working with Alcatel-Lucent we increase our ability to help enterprise customers and carriers be a part of it.” – Dell and Alcatel-Lucent Team Up for Network Virtualization by Arpit Joshipura. “The digitization of our world will be the driver of change. The enabler will be the “cloud integrated network,” which has seemingly infinite capacity and scales from local to global with sustainable economics. 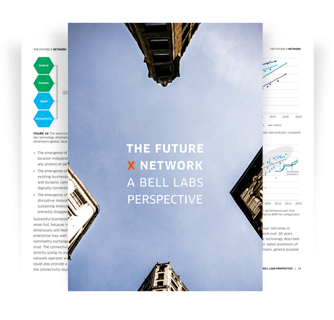 And the benefit will be the emergence of automated systems that provide augmented intelligence to any critical analysis task.” – The Future X Network: A Bell Labs Perspective. Link to Dell World 2015 photo album. Our team was in Austin at Dell World 2015 on October 20-22. Alcatel-Lucent’s booth featured the Lean NFV Ops demonstration, which captured quite a bit of attention. This was remarkable given NFV’s (Network Functions Virtualization) painstaking focus on the telecommunications sector (the carrier environment to be more specific) and the event’s broader scope providing coverage for a wide range of enterprise IT (Information Technology) systems. We were asked if we we “brought our stuff from the future” a few times. That recurrent compliment referred to Marty McFly’s trip to October 21, 2015, the main character in the blockbuster “Back to the Future” movie series. 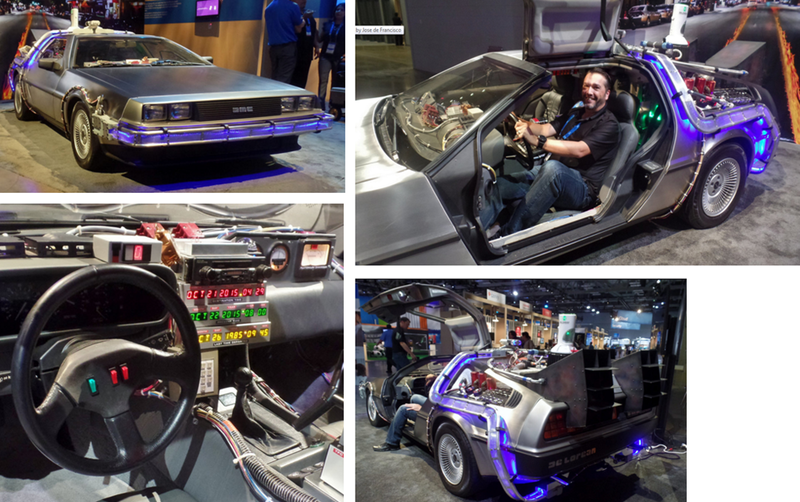 Dell World’s DeLorean (above) is a replica of the movie’s time machine. The fact is that adapting known and proven to work Lean principles and, moreover, creating new ones for the cloud age has been consistently well received and praised since we first unveiled this program. The Lean NFV Ops Roadshow has been running for about a year already and keeps growing strong. Working with a set of virtualization technologies that are readily available, and doing so by operating a sophisticated end-to-end system delivering 4G’s mobile broadband and VoLTE (Voice over Long Term Evolution) services makes Lean NFV Ops expose a very compelling value proposition. We embrace Lean by engineering systems that are effective and highly efficient. Effectiveness refers to operating in an HA (High Availability) environment driven by SLA (Service Level Agreements) compliance, which entails performance and QoS (Quality of Service) requirements. This being an environment where the services’ QoE (Quality of Experience) is paramount. High efficiency means getting all of that done with a holistic approach (end-to-end systems engineering x TCO, total cost of ownership) optimizing “cost per bit” delivered coupled with “cost per workload.” TCO is key as we operate at the intersection between “effectiveness” and “high efficiency” at any scale: it is imperative to start and stay nimble by saving virtualization systems from sprawling, inflict overhead and become bloated overtime. What’s really exciting is that the end result powers a new generation of dynamic services, spurring innovation and continuous improvement in the process. By the way, we do have “time machine” viewer in our system. No joke, this is the one feature that we use to review events and deployments that have already taken place, step by step and in an time lapse mode. One more thing… : ) Bell Labs has released a new book, which I look forward to reading. My understanding is that “The Future X Network” addresses the landscape for networking technologies in 2020 and beyond. The first chapter is 30+ pages long and publicly available. The complete book has 470+ pages and can be purchased on Amazon. Carrier Network Virtualization. Palo Alto, November 30 – December 3. “Communication Networks Reloaded – See and experience key emerging technologies converging to deliver Software Defined Networking (SDN) and Network Functions Virtualization (NFV) in innovative ways that clearly outpace and disrupt today’s communication networks. This tech talk addresses sophisticated concepts in an interactive and fast paced demonstration where services are subjected to a number of configuration changes in real time, including deployment, scaling and failures. Note that this is not a Proof of Concept (PoC) project but rather a state of the art demonstration integrating commercial and open source solutions. “Lean NFV Ops – Lean Network Functions Virtualization Operations is a practice delivering nimble communication systems that remain lean and agile at any scale. Lean NFV Ops addresses a pressing need for enabling what can otherwise become elusive dynamic services impacted by sprawling silos, bloated architectures and disjointed development creep. This presentation introduces Lean’s quality management principles defined at the intersection of service level effectiveness and highly efficient asset utilization. We will discuss maturity and technology readiness as well as RAS (Reliability, Availability, Serviceability) in the context of software defined communication systems. Illinois Institute of Technology, Real Time Communications Conference & Expo 2015. Network densification: what works, what doesn’t and what’s to come. Mithun Thakur, Verizon Wireless. Architecture for B2B2C. Tetsuya Hishiki, NTT. A hybrid Deep Packet Inspection architecture for NFV: Emera Ben Abdekrim, Université du Québec. Cognitive security: security analytics and autonomics for virtualized networks. Lalita Jagadeesan, Alcatel-Lucent. 5G: what can we learn from the previous four generations. Henning Schulzrinne, Columbia University. This other link will take you the complete conference agenda covering Mobile Networks & Applications, Internet of Things and Next Generation Emergency Communications, in addition the the WebRTC and Cloud Communications Track that I have the pleasure to chair with Alan Johnston. Above, in lower right corner, you can also see a photograph of Anne Lee’s immersive 3D presentation. Anne gave her talk using Rapport with WebRTC, coupled with Intel’s RealSense and Personify, a Chicago start-up. These are the slides I talked about yesterday. I would like to take this chance to thank those of you attending my two sessions on Communication Networks Reloaded for your questions and interest in Lean NFV Ops. We ended up extending the combined sessions’ total time to around 90 minutes. Needless to say that I will be glad to keep the conversation going over email, on a call or in person as you see fit. Page 2: up front positioning of PMO vs. FMO basics with the Venn Diagram me that defines Lean NFV Ops. Pages 3-16: discussion on the Lean NFV Ops demonstration system. Page 31: minor improvements to the PMO vs. FMO comparison table on DevOps. 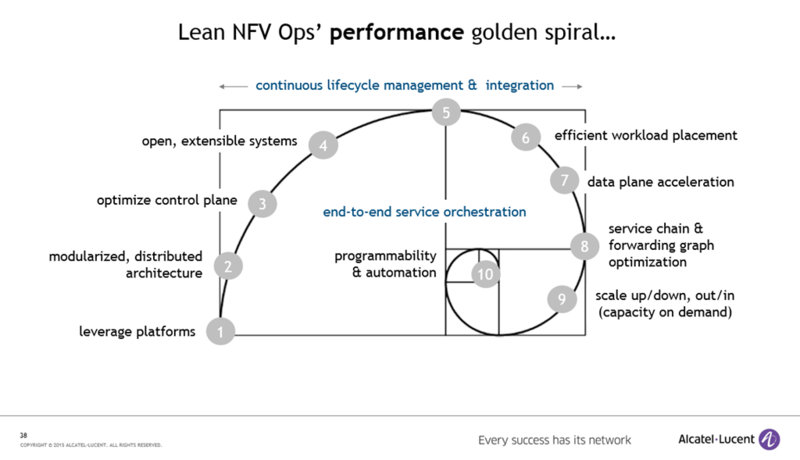 Page 38: Lean NFV Op’s new “golden spiral” on application performance. Page 39: a more detailed PMO vs. FMO matrix deconstructing Lean, NFV and Ops. Page 41: new link to our most recent webinar hosted by Layer123 a week ago. I also added a new “food for thought” slide (page 19) with insights I captured while reading “The Evolution of Useful Things.” This book was published back in 1992 by Henry Petroski, an engineer focusing on failure analysis and a passion for exploring design principles conveyed by day-to-day objects. Dell World. Austin, Oct 20-22. Carrier Network Virtualization. Palo Alto, Nov 30- Dec 3. Thanks to Ted East, Andy Must and the team at CIC for their support, Karyn Homer and Rapport’s Ed Elkin and Sue White. And, once again, congratulating Warren Bent, Tom Costello and Carol Davids on another successful IIT Real Time Comms.